Very handsome cylindrical box with lid, black lacquer exterior and red lacquer interior, resting on four supports ending in legs. The body with horizontal ribs, metal fittings etched with hexagons. 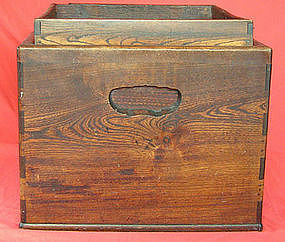 Similar boxes are known as hokai, and were used to store the shells for kai-awase, the "shell matching game." Dark brown lacquer exterior with red lacquer interior. Late 19th/early 20th century Meiji. Some wear and tear. Measurements: H 16 3/4", D 14." 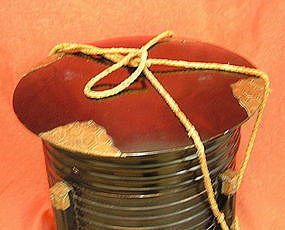 Japanese Tokyo style hibachi or charcoal brazier, made of keyaki or elm wood with copper liner, with two oval recessed handles, and a wooden gallery. Fitted with a contemporary removable pecan wood top for use as table. Late 19th century Meiji period. Measurements: H 15", 17" square. Provenance: Private Collection. Very well-carved figure of one of the seven lucky gods, highlighted in incised, stenciled and painted fashion, and holding his gnarled staff and fan, with signature on base. Excellent condition. 19th/ 20th Century Meiji Period. Measurements: 7 1/2" high. Provenance: Acquired in the 1960s. 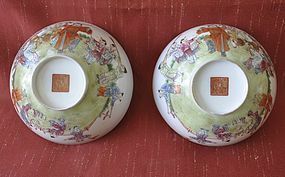 Pair of Chinese eggshell porcelain bowls, decorated in enamel colors, on the interior with palace children at play, and the exterior with butterflies. 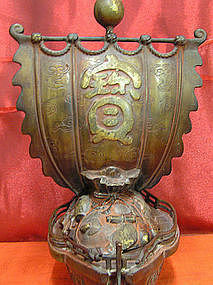 The base with six character seal script red on gilt Qianlong mark. Republic Period. 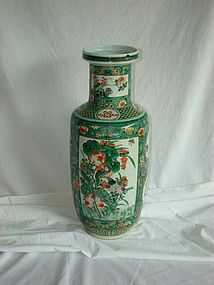 Provenance: Acquired prior to 1949 in Asia. Inquire about detailed provenance. 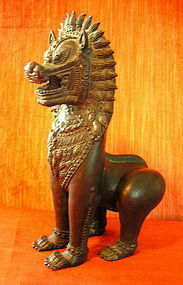 A very handsome bronze lion, a protective Buddhist animal, protecting people, homes and temples, and the Thai version of the Chinese guardian lion. Great details, fine craftsmanship and in fine condition. The piece comes from a private collection acquired in the early 1960's. The singha stands 10 1/2" high and measures 5" in length. Protect yourself! Chinese black lacquer and gilt shop sign. Can be translated as Hall of Good Fortune. 19th/20th century. Measurements: H 16 ", L 48 1/4". Provenance: Private Collection. 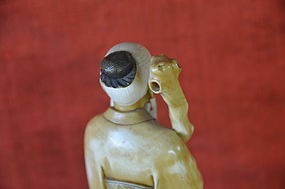 Seated Buddha statue with downcast eyes; "calling the earth to witness" mudra, full face and curled headdress with ushnisha. Possible repair to neck. 19th/early 20th century rendition of Uthong style. Measurements: 19 1/" high; 13 3/4" at widest point; weight: 20.2 lbs. Provenance: Private Collection. Acquired in the early 1960's. 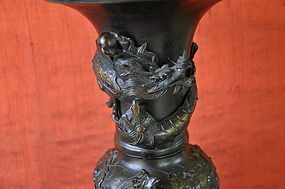 This lamp was converted from a vase and has deep relief decoration with a dragon wrapping around the upper body, and a phoenix seated on rock formation on the lower half of the vase, paired together with a quail and lotus paddy. Sturdy bronze body with intricate carving. Meiji Period. Measurements: Stands 14 1/2" high. Provenance: Acquired in the 1960s. 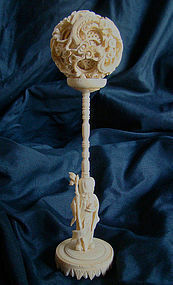 Intricately carved Chinese ivory puzzle ball on a pedestal stand with Shoulao (god of longevity), with approximately twelve concentric balls decorated with fierce dragons on cloud ground. Early 20th century. Provenance information: Acquired in the early part of the 20th century. Measurements: 9 1/4" in height. Decorated in red and black, with two children at play under a willow tree. Calligraphy bids good wishes, in center interior of box. Border has large blossoms and key fret motif. Overall size is large. 19th/ 20th Century. Measurements: 7 1/2" high, 14" in diameter. Provenance: Acquired in the 1960s. Very charming and elaborate Chinese Miao baby carrier with highly detailed silk on cotton embroidery, using several techniques including extensive seed stitch, outline braiding, quilting and applique, and showing butterflies and stylized animals. Fine condition. 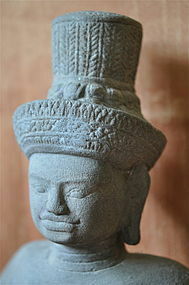 Very striking grey sandstone Khmer style statue of Vishnu, with plaited hair gathered in high chignon fashion. Fine profile and detail. With four arms broken off at elbows. 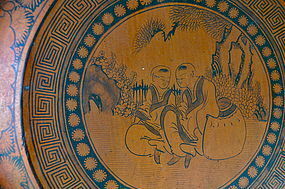 This is a rendition of a Khmer piece, and according to provenance information was made in Thailand, at the beginning of the 20th century. Measurements: 24"; teak wood base: H 5 1/2". Provenance: Private Collection. Decorated on four sides with frolicking lions; with good wishes mark on base. Provenance: Acquired 1968/71. Please e-mail for price information. 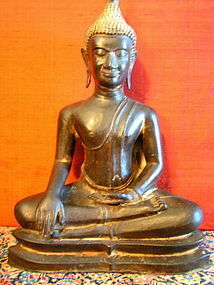 Thai gilt bronze Ayudhya Buddha. H 27 1/2". Acquired 1968-1971. 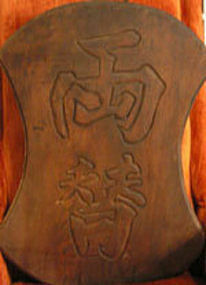 An antique shop sign carved with identical kanji letters on both sides - meaning "exchange" (ryo-gae-ya) - for a banker? Late 19th century Meiji. 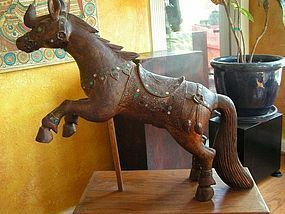 An example of Japanese mingei. Measurements: H 23", W at widest point 17".